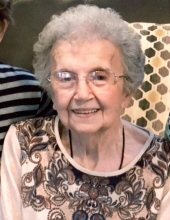 88 year old Wayne City, Illinois resident Betty June Simpson passed away Sunday, March 10th 2019 at Fairfield Memorial Hospital Skilled Care Unit. Betty was a homemaker. She had worked for Jim Wilson and Elias Simpson in the Wayne County Circuit Clerk's office for a number of years. She was a member of Sims Missionary Baptist Church where she served as pianist for several years. Betty was born June 25, 1930 in Sims, Illinois to Herbert & Hazel (Jones) Higdon.She was married to Dale Simpson on September 24, 1949 in Sims, and he preceded her in death on December 28, 2009. Betty is survived by two daughters, Cheryl Edmison and her husband Noel of Wayne City, Illinois and Cathy LeMond (Steve Brokaw) of Fairfield, Illinois. Five grandchildren, and fifteen great grandchildren. Preceding her in death were her parents, husband, one brother, one sister and an infant sister. Funeral services for Betty June Simpson will be held at 11:00 a.m. Friday, March 15, 2019 at Archie L. Sanders Memorial Chapel in Wayne City. Burial will follow in Thomason Cemetery. Visitation will be held 5 to 7p.m. Thursday, March 14th, 2019 at Nale's Funeral Home in Fairfield. Memorials may be given to the Sims Missionary Baptist Church and will be accepted at Nale's Funeral Home or at the chapel.